Today you'll learn to design a current divider circuit using basic current divider rule. Design a current divider which attenuates 2 A current to 5 mA. 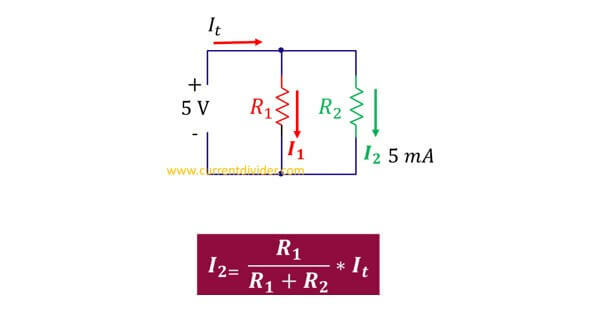 The operating voltage is 5 V.
So a current divider whose design involves R1 = 2.50 Ω and R2 = 1 kΩ will dissipate 2 A to 5 mA. Design a divider which divides input current to the ratio of 3:2. So that that the equivalent resistance is 100 Ω. The input is 3 + 2 = 5, lets assume it in amperes. 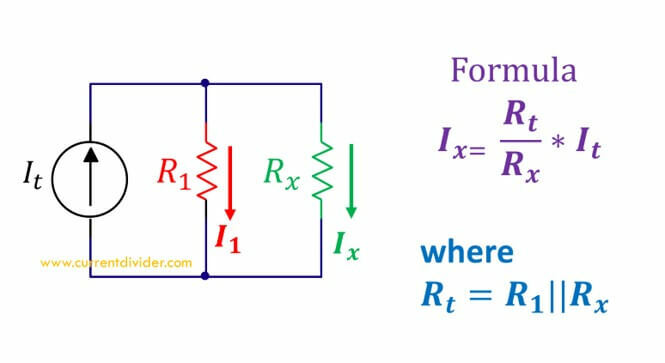 From formula of equivalent resistance. 1/Req = 1/R1 + 1/R2. 1/100 = 1/R1 + 1/R2.